Frederick Arthur Bridgman is well known as an Orientalist painter. He produced a large number of pictures in his lifetime, traveled extensively and kept company with some of the better-known artists of the 19th century. Spending much of his life as an expatriate, Bridgman had very curious beginnings. Born in Tuskegee, Alabama in 1847, he had a father who was a practicing physician from the north who died when Frederick was only three. By his early teens, with the Civil War just around the corner, Frederick and his family relocated to Boston where he soon began to apprentice at the American Banknote Company. He excelled as an engraver as he took classes in drawing and design at night. He first exhibited a painting at the Brooklyn Art Association in 1865. By 1866, Bridgman, just 19 years old, made the courageous decision to move to France where he began to study under Philadelphia artist Robert Wylie who was at the head of a growing American art colony in Pont-Aven in Brittany. Bridgman’s discipline and commitment were intense. Within two years in fact, his talent earned him a spot in the atelier of the most famous and most accomplished of all Orientalist painters, Jean-Leon Gérôme. Bridgman quickly earned the respect of his teacher and the other students. Bridgman made his first trip to Tangier in 1872. It was this trip that would alter his original plan to be a painter of American landscapes and would expose him to scenes and subjects that would eventually be associated directly with him. Bridgman’s first trip took him through Morocco and Algiers, the latter of which was a favorite of French travelers at the time. 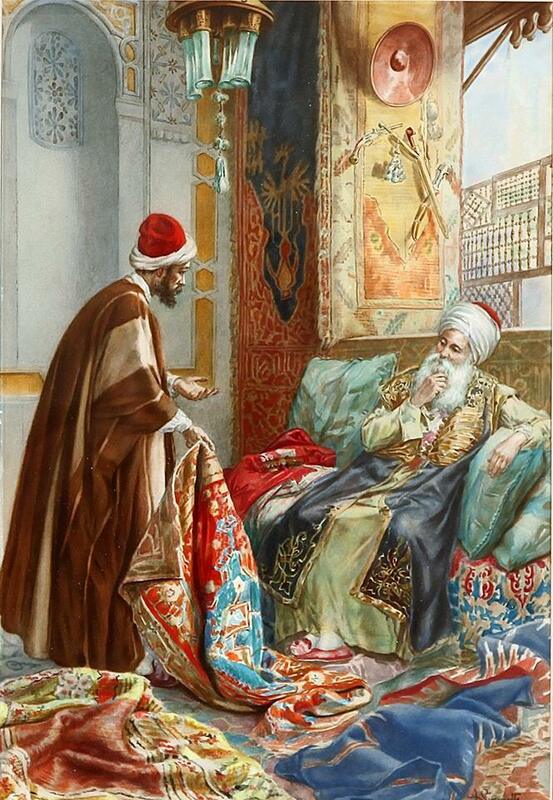 Bridgman became fascinated with the color, light and lifestyle of Arab and Berber people as experienced in cafes, bazaars and private living quarters. In his travels, Bridgman experienced both the luxurious life found in any European colonial establishment as well as the barren and austere life of the locals when he traveled away from the bigger cities and into the desert and oasis regions. And Bridgman, like many of his painter-traveler counterparts of the era, was not immune to the hostile conditions of the Sahara desert. Near the town of Biskra he suffered a sunstroke which brought him within an inch of his life. He kept detailed notes of his journeys, and after convalescing, he published an account of his experiences in his book, Winters in Algiers. Later he would rent a studio in the poor quarters of Biskra where he began to do extensive studies and paintings of models. This was not an easy task among the private, weary locals who were always suspicious of European travelers. Bridgman began to learn Arabic and maintained an intensive work schedule. This is the period during which he would develop the elements and techniques that would eventually define his style. He spent 1873-74 in Egypt, touring up the Nile with friend and fellow American painter, Charles Sprague Pearce. In Cairo they stayed in the now infamous Shepheard’s Hotel. Bridgman practically defined the genre of the Near Eastern female scene. While access to such places as private homes or interior courtyards has been characteristically difficult even for locals, let alone foreigners, artists like Jean Leon Gérôme and Bridgman seemed to have faired better than many others in befriending locals and earning their trust enough to sketch and paint their private homes. This implied impenetrability or the ‘secret life’ of the odalisques became a great rage in Europe, and artists including Bridgman had no trouble in finding eager buyers for his pictures. Orientalist Interior is one such picture. Bridgman had favorite elements that he often used in great variation including seated women around a low table, mothers and daughters doing household chores, or relaxing in the afternoon in open patios or near the sunlight of an open courtyard. Orientalist Interior contains all these elements. Using the basic characteristics of North African, Moorish architecture and interior design, Bridgman was able to produce a number of such pictures both en route while traveling and when back in Europe in his studio space. This picture is dated 1900, but many pictures of a similar style may have been painted many years before and many years after this date. The warm glow from nearby sunlight, the spattering of sunlight through the wooden lattice of the wall mashrabiyas, hanging urns and draped cloth and carpets were all favorite tools and props of Bridgman, which he went back to throughout his life. In 1888, he had a show in New York at the American Art Gallery of more than three hundred of his works. Shortly after he was elected to the National Academy of Design, and in 1907 was made an officer of the Legion d’Honneur. Bridgman’s career remained on top until the outbreak of the First World War around which time he retired to a home he had in Lyons-la-Foret in Normandy. He died in 1928. 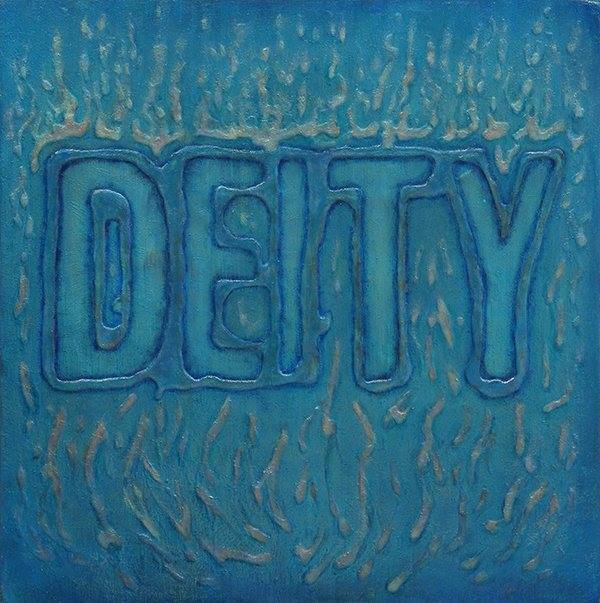 Laura Gonzalez (American, Contemporary), ‘’Deity,” 2006, oil, 6 inch helvetica die-cut lettering, white glue and metallic poweders on canvas, signed and dated verso, artist title label affixed verso, canvas (unframed): 16”h x 16”w. Camilo Alejandro Egas Silva was born in Quito, Ecuador in 1889 and grew up in the San Blas neighborhood. He studied at the College of San Gabriel y Mejia before enrolling, Egas studied at the Escuela de Bellas Artes in Quito in 1905. He stayed at the school until 1911 and studied under Paul Bar and Víctor Puiz. In 1919, Egas studied at the Real Academia de Bellas Artes de San Fernando in Madrid on a second government grant. 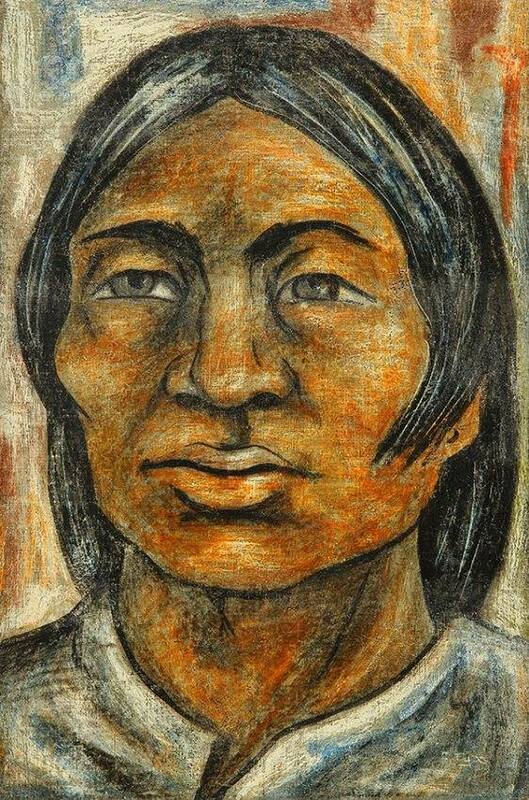 Egas returned to Ecuador in 1926 and played a pivotal role in forming the Indigenist Movement together with Oswaldo Guayasamin. The Indian theme seen in his work was related to the rise of Socialism and the constitution of Marxist parties in Latin America. In 1926, Egas founded Ecuador’s first art periodical, Helice (Helix). Egas combined the Costumbrista painting tradition of Ecuador with the influences of contemporary art movements other countries. He used his knowledge of European art techniques to create dramatic, large-scale oil paintings of Andean indigenous peoples and themes, bringing Indigenismo to the European ‘high art’ world. Egas’s ideology and aesthetic of the 1910s and 1920s connect him to Spanish modernism, a movement espoused by the School of Fine Arts at Quito, which was inspired by its modernity and nationalism. During this time, Egas taught at the Normal de Quito and served as art director of the National Theatre. In 1927, Egas moved to New York, but occasionally lived in Spain and Italy, and made numerous trips back to Ecuador. He consecutively assimilated various styles: first, Social Realism, then Surrealism, Neo-Cubism, and finally Abstract Expressionism. In New York, he befriended José Clemente Orozco. In the 1930s, Egas’s work included two murals, Harvesting Food in Ecuador: No Profit Motif in Any Face or Figure and Harvesting Food in North America. In 1932 Egas began teaching at the New School for Social Research in New York in and became their first Director of Art in 1935. He taught and directed the art department until his death in 1962, the same year that the school gave him an honorary doctorate in fine arts. In 1939, Camilo Egas was responsible for decorating and painting a mural for the Ecuadorian Pavilion of the New York World’s Fair. 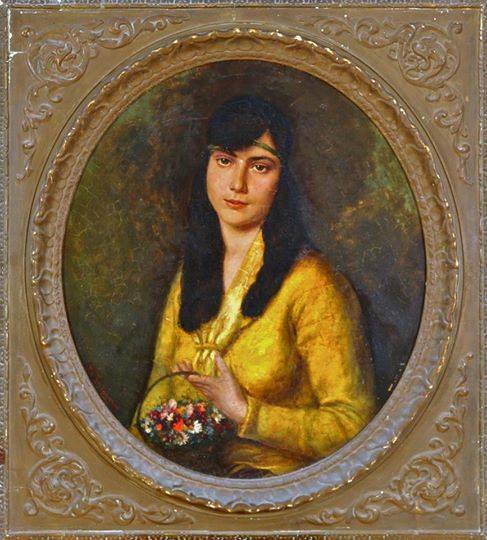 The Museo Jijon y Caamano de Arqueologia y Arte Colonial in Quito commissioned him to paint a series of work in oils exploring Andean Indian life. During the 1950s, Egas exhibited his work in Caracas, Quito, and New York. Egas died on September 18, 1962 in New York City, New York. The Museo Camilo Egas in Quito opened in 1981 with a permanent exhibition of his work but is now closed. The collection belongs to the Banco Central del Ecuador, and Museo Camilo Egas has been relocated to Venezuela 1302 and Esmeraldas Corner, close to Banco Central. Rodríguez, Marco Antonio and Mario Monteforte. Un Antelatado de su Tiempo: Camilo Egas. Latin Art Museum. Ades, Dawn. Art in Latin America: The Modern Era 1820-1980. New Haven: Yale University Press, 2006: 343. Andermann, Jens and William Rowe, eds. Images of power: Iconography, and State in Latin America. New York: Berghahn Books, 2006: 99-125. Chunn was born in Los Angeles, California. She attended the California Institute of the Arts in Valencia where she earned her Bachelor’s degree in Fine Arts in 1969. She has received a painting fellowship from the National Endowment for the Arts, and has participated in numerous exhibitions throughout her career. 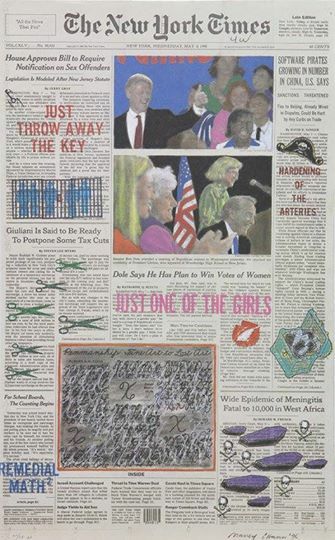 Beginning in the early 1980s, solo exhibitions of her artwork have been held at institutions including the Carnegie Mellon College of Fine Arts in Pittsburgh, Pennsylvania; Concord Gallery of New York City; Corcoran Gallery in Washington, D.C.; and the Museum of Contemporary Art in Chicago, Illinois. Since 1987, the Ronald Feldman Gallery in New York City has displayed her work in a number of shows up until the more recent in 2004. Group shows in which Chunn was included have been organized by a number of art establishments, such as the Aldrich Museum of Contemporary Art in Ridgefield, Connecticut; Columbia College of Art Gallery in Chicago, Illinois; Museum of Contemporary Art in Zagreb, Croatia; and the Weatherspoon Art Gallery at the University of North Carolina at Greensboro. Studied at the Academy of Rome with G. Costantini. Simonetti devoted himself to the study of landscape from the true (Villa Borghese, Rome, Galleria Comunale d’Arte Moderna) and subject to the Orientalists. From time to time he presented his works at exhibitions of the Association of Roman watercolorists (1904, Impression, Venice, 1906 1908 The Kiss), and in 1906 was present at the National Exhibition of Milan (Dawn of Lent). In 1919, at the invitation of O. Carlandi, became part of the group of “XXV of the Roman Campagna.